Yet another example of the Targum editing an op-ed…except this time, it was actually a press release from the Rutgers Hillel. Sunday night, Oct. 6, very realistic “eviction notices” were placed under doors of student residence halls and apartment buildings at the University. They were so realistic, in fact, that many students were, at first, led to believe they were being evicted from their place of residence. The notice, a publicity stunt by Rutgers Students for Justice in Palestine, was distributed to spread propaganda, create confusion and to gain attention. RSJP’s actions were a blatant violation of the university code of conduct regarding how groups may or may not solicit students on campus. Members of RSJP placed these deceptive notices under residence hall doors on all five campuses. SJP’s actions were a blatant violation of the university code of conduct regarding how groups may or may not solicit students on campus. 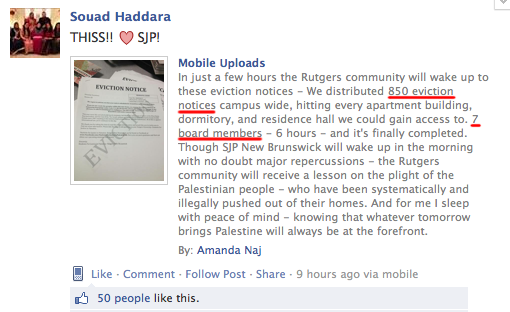 Board members of SJP placed these deceptive notices in 850 student dorm rooms, despite university rules and regulations forbidding them to do so. Respecting students’ rights to privacy and giving them the safe space necessary to be free from solicitation and imposition in their places of residence is not only a hallmark feature of our university but a necessary component to enable and foster the growth of inclusion and diversity within our community. Making students feel unsafe in their homes is apparently part of the RSJP strategy, which also includes propagating half-truths, misstatements and historical inaccuracies. The fraudulent “eviction notice” is a de-facto example of this reprehensible agenda. The Rutgers Hillel Center for Israel Engagement was established to foster a positive voice for Israel while defending Israel against slanderous attacks such as this. We decry this manipulation and intimidation of students through stunts employed to promote a political agenda. We hope our university will work toward making our campuses and students feel safe and free from harassment or intimidation by agenda-driven interest groups — to enable the proper and profound exchange of ideas in a civil and productive manner fostering greater communication and growth for everyone. Rutgers Hillel looks forward to being a positive contributor to such an environment. Rabbi Esther Reed is the senior associate director of Rutgers Hillel. First, instead of attributing the press release to Rutgers Hillel itself, they attributed it to Rabbi Esther Reed. Although she is the Senior Associate Director, this statement was not an personal op-ed penned by her. It is an official press release from the Hillel itself, and should be attributed as such. The Hillel also did not make the claim that every campus got hit with the notices. We were only aware of College Ave getting the notices, because we received several distressed phone calls from students on College Ave. So, not only has the Targum decided to change our press release and remove verifiable, uncontested information, they also added their own claims about who got the notices. Strange, of course…unless the Opinions Editor is an SJP member and has inside information, as well as a vested interest in the situation. Finally, they removed the statement that there are “university rules and regulations forbidding them to do so.” Is this not verifiable? Does Rutgers University allow fraudulent eviction and demolition notices to be solicited under the doors of dorm rooms and residence halls? Certainly not…so why did it get removed? 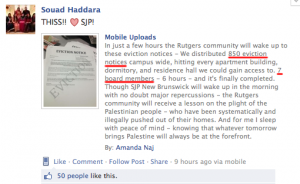 In addition, Amanda Naj admits herself that it was against University policy – why else would SJP wake up with “major repercussions”? The Daily Targum, and specifically their Opinions Editor, Amani Al-Khatahtbeh (she also goes by Amani Alkhat), should not be allowed to make substantial modifications to any op-eds, especially those that are press releases from a Rutgers organization.